Word is getting out in the village about the doctor's 'little problem' with blood. When Peter Cronk is hurt concern about him brings Martin and Louisa closer together. 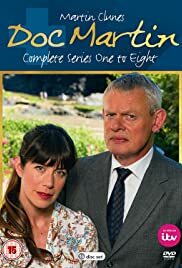 How many episodes of Doc Martin have you seen? Dr. Martin Ellingham: All right, Caroline, I'm going to give you an injection. Danny Steel: [gets down on one knee, hands clasped together] I'm saying a prayer for you, Caroline. 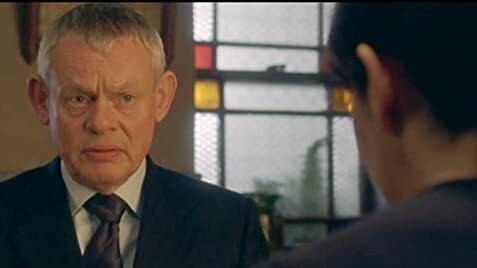 Dr. Martin Ellingham: [eyeing Danny] Just a little prick. I thought that the story of an arrogant top-flight London surgeon trying to run a practice in a chummy town in Cornwall would make for a one-note fish-out-of-water series, but instead it has been a delight every week. Doctor Martin Ellingham, for a reason that will be revealed later in the series, decides to transplant himself to a seaside village in Cornwall where he spent a few summers as a child with an aunt, who presently runs an organic farm there. Being a terse, intensely closed, firmly impersonal fellow, he is appalled at the ways of the village people who consider themselves as one big, happy, nosy family. Of course, in a series like this, we expected the clash of cultures between the coldly efficient doctor and the quirky little town to be the main storyline, but it is the diversity of their quirkiness (some of which will surprise you!) and the inventive medical cases that call the doctor's attention, and the personal incidents that test his patience, that will keep you coming back for more each week. While there is a lead cast -- Doctor Ellingham (who intensely dislikes the too familiar "Doc Martin" that people insist on calling him), the head schoolteacher who develops an interest in him, despite herself, the affable teddy bear of a police constable, the exasperating receptionist with a chip on her shoulder, and the jokey, prank-loving plumber played by the wonderful Ian McNeice -- none of the characters that show up fleetingly in the beginning is actually a one-off. Eventually, everyone's back story is brought to the fore. This makes the town more and more three-dimensional and you may find yourself caring quite a lot for the individuals that make up this engaging little village; yes, even for the irascible doctor, whose own back story is rather quite poignant and makes his unbending personality more understandable. The best thing about the series is that it accomplishes all this without the schmaltz that usually ruins programs of this genre. For intelligent, humorous and charming entertainment, spend an hour in the village by the sea of Doc Martin. Who knows? Maybe someday, people will be trying to find Portwenn in the same way that fans of veterinarian-writer James Herriot have been looking for his fictional Darrowby. I would certainly give it a try. 119 of 125 people found this review helpful. Was this review helpful to you?